Many processes require solids to be discharged intermittently during operation, or for processes with liquids containing higher solids content (up to approx. 10%) the intermittent solids discharge separator is an ideal solution. As with disk separators with solid-wall bowl, the disk separators with self-cleaning bowl are equipped with a stack of conical disks to create a large equivalent clarification area within a relatively small bowl volume. These separators are likewise available as versions for clarification and separation. Separators with self-cleaning bowl are able to periodically discharge the separated solids at full speed. 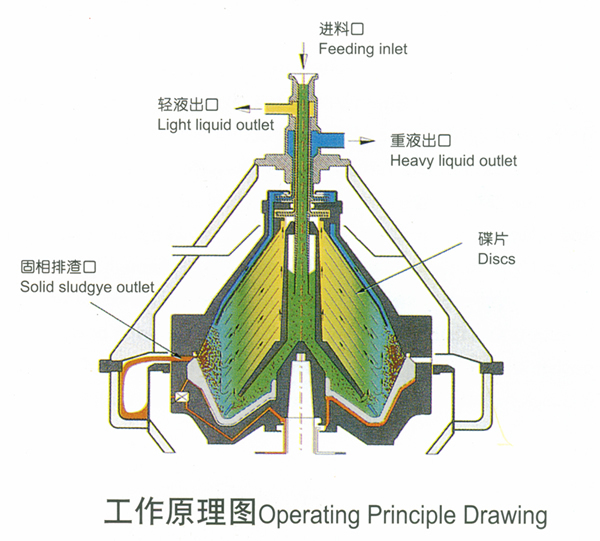 Designed with a unique hydraulic system below the separation space in the bowl which forces the sliding piston to drop down, thus opening the solids ports at the bowl periphery at preset intervals. This provides what is known as a self-cleaning effect when the solids are removed all at once during operation. For this purpose, these ports are opened and closed by means of a movable sliding piston located in the bowl bottom. The opening mechanism is actuated hydraulically. Water is normally used as a control medium; in special cases, low-viscous organic fluids can also be used. This opening mechanism enables both partial ejections and total ejections. Total ejections involve discharging the entire contents of the bowl with closed feed valve. In the case of a partial ejection, by contrast, only part of the bowl contents is ejected with open feed valve. Usually, self-cleaning separator is divided into two types. One is used for solids and two liquid phases from each other in one single continuous process, it is so called purifier. The other is used for solids and one liquid phase from each other, it is so called clarifier. This design has vast applications in all industries and is one of the most common types of disc stack centrifuge from Huading Separator.